Some days, I’m not just a writer. I’m also a casual gamer. I like to play in the morning as I eat breakfast, exercising my thumbs and my brain in order to wake it up. Anyway, do you see that dashing man up there with piercing orange eyes? And that devilish, arrogant smirk across his lips? His name is Raphael Sorel, a character from the popular weapon-based fighting game series known officially as Soul. 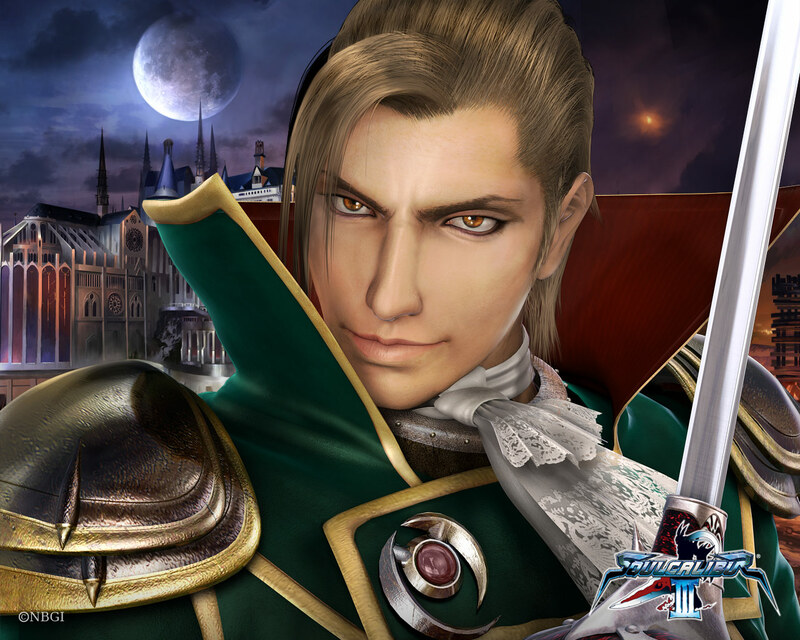 He debuted in Soulcalibur II, the third game in the Soul series, and has stayed in the series games ever since. Raphael is what you would call my man—er, ahem, sorry. I meant my “main,” meaning that I mainly use him to fight in the Soulcalibur games I own. His fighting style is what I’d call a mixture of swordplay and mind games, because he’s very fast and hard to predict if you’re really skillful with him. He’s a vampire, like a spider anxious to get the first kill, which suits his dark, sadistic personality and makes him a fascinating character to play (because he’s considered evil in the game, too). I know a few of his attacks and can create decent strings of them to leave weaker CPU-driven opponents on the ground. Yet, I am by no means an expert. I still have a lot to learn. And what I’ve realized is that in the same way I’m learning to get better with using Raphael, I’m learning to get better at my writing. I’d felt really in sync with him because I’d play with him so much. At that point, Raphael had become my main forever. And once I’d unlocked everything, I followed up my Soul series journey by purchasing Soulcalibur III. I had known about the Soul series before freshman year thanks to Soulcalibur III. I was playing it at the house of a childhood friend, and with their father, who was unbelievably good. Playing it for the first time all those years ago, I was floored by the fact that in Soulcalibur III, you could make your own character. Soulcalibur III was the first time character creation was introduced. You can make your own fighter, with their own weapons, with green hair, with a certain haircut—anything. I thought that was really, really cool. But to play it for myself and know the game’s storyline, context, and art made it even richer to play. Many people like Soulcalibur II the best, and I don’t blame them. It’s a great game with great mechanics, and is a very solid experience. But to me, Soulcalibur III is the Soul series peak. The amount of characters you can play as, the different fighting styles, all the unlockable content, the epic music, the awesome graphics—Gaahhhh! Pant, pant… Okay… Okay. I’ll stop gushing. I have to get back to Raphael anyway, because he’s important. With new games come new attacks to learn, new hurdles, and new weaknesses I did not know I had. I consider myself to be an intermediate-level Soulcalibur player. I know the basics of the game and a few advanced techniques, but sometimes I come up to CPU opponents set on hard difficulties that wipe the floor with me. Even in the video games settings when I set the difficulty level to intermediate, that’s usually where I am. And that’s how I feel with my writing ability. I know what a story requires and feel like I know a lot about how a story should work, but sometimes, when I get to that blank screen, doubts, fears, and lack of knowledge eats away at me. I know I have the potential to be a really advanced writer. I just need to hone my focus. And this past year I feel as though I’ve found out some of those weakness of mine. Just for a comparative analogy, the transition from Soulcalibur II to Soulcalibur III for me is very much like gaining knowledge on how to write, but slipping up because you haven’t practiced the new technique enough. I’ve discovered that many of the attacks I don’t know for Raphael require me to move diagonally instead of a clear left, right, up, or down. And when I try to execute them, they’re obviously not as quick as the moves that I’m familiar with. I have to consciously remember them and execute them which takes more time, so my opponent gets the better of me as I try to figure out what I’m doing. In the same way, I’ve discovered most of my writing problems stem with my characters or description. I need to consciously apply the writing techniques I have learned, even if they take a slow amount of time to execute at first. But it’s a good thing that I struggle. And whoever out there is a writer, it’s good that you struggle, too. Really, it is. Because that means your brain is working, carving out easy patterns in your head so that once you do it enough, it becomes second thought and automatic. Fighting and writing, in this way, are very much the same. I don’t believe that writing well is a God-given gift. The ideas and insights you come up with for stories might be, but as for writing really well, I believe that’s a skill—something that you have to do every day and consciously work at it, much like an actual martial arts fighter or a casual video gamer playing Soulcalibur. On the battlefield, no one can predict exactly what will happen, where their opponent will swing, etc. On the field of writing, even when you’ve written an outline for your book, or you know your techniques really well, something will more than likely surprise you, and require you to use that technique you’ve been working at for weeks, months, or years. They both require daily dedication, heart, spirit, and mind. And there is always learning to be had. Always. Even my writing friend tells me to treat writing like an Olympic sport—to practice and try to surpass yourself everyday. I don’t think that’s bad advice.